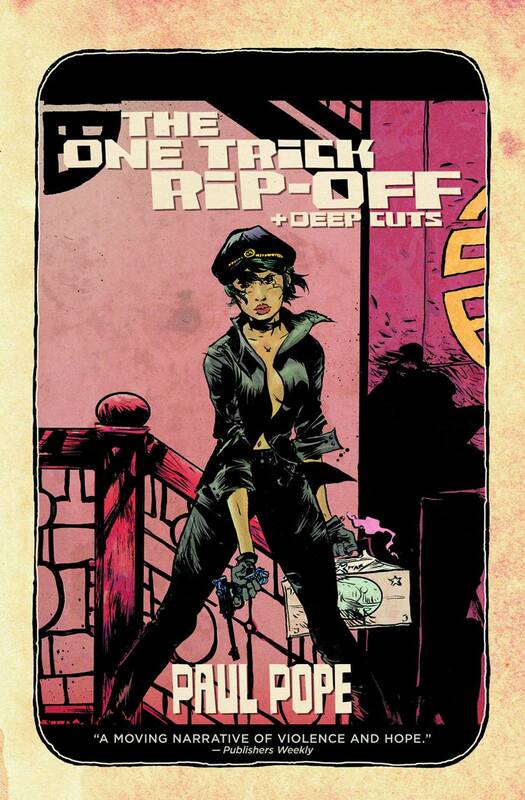 I tend to have a hard time describing Paul Pope’s work whenever a friend or a customer at my store asks about a particular title of his; that is, until I finished the new collection of his older material, One Trick Rip-off/Deep Cuts. Paul Pope writes tragedies, and he writes them damn well. Before this encounter with Pope, I had been introduced to 100% and then proceeded to rant and rave about it like a mad-man to anyone who would listen. I was certain I would not, any time soon, come across anything that could top it. I was astounded at how Pope had wrapped a romance comic in the dressings of science-fiction and imbued in his story so much heart and depth that readers could help but be swept away in the grandeur and spectacle of it all. But that all changed the second I put down One Trick Rip-off/Deep Cuts. The title story of this collection is another deception on Pope’s part. What seems like heist book is at its core a tragedy, almost Elizabethan in scope. The story follows Tubby and his girl Vim’s scheme to rip off the One-trick gang and escape their current fates. Of course, the couple runs into trouble along the way, but I will let you read all about that on your own. Instead, let’s take a second to appreciate just how fantastically Pope puts together this story. The craft of One Trick Rip-off is at the master level. With Pope handling both the writing and artistry of the story, he allows himself the freedom to explore. There are moments where character work stands out and drives the narrative, yet there is an equal amount of time where vast and expressionist panels sweep the reader into the twisted, often grotesque world Pope’s protagonists play out their drama in. Combined with a unique and splendid approach to sound effects and lettering, the coloring of the book (done by the very talented Jamie Grant of All-Star Superman renown) hangs an atmosphere over Pope’s artwork that envelops the reader, dragging him into the fights and tears of the story. It is an arduous task to single out one aspect of this story that makes it so praise-worthy. One Trick Rip-off works as a package, as a whole. It is very much meant to create and sustain world for Pope’s cautionary tale to exist in, but also a mesmerizing one for readers to marvel and enjoy. In this sense, One Trick Rip-off is one of the most astonishingly successful comics I have ever found in my hands. I was lost in Pope’s world the entire time I was reading this story, and was quite morose when I had to vacate the world and its inhabitants. It would be unforgivable if I failed to mention the supplemental material found in this volume as well. What I find fascinating not only about the title tale, but even more so the rest of the short stories contained within One Trick Rip-off/Deep Cuts is the progression and development of Pope as a writer and as an artist throughout the volume. Fans of Pope are sure to revel in the back up stories, especially the rarities, as they give invaluable insight to his talent and vision. Most noteworthy is the Super Trouble story, which Pope’s audience has previously never had the opportunity to encounter. This is where I would advise readers to spend as much time as possible; these so-called deep cuts are a variable copia of Pope’s different attempts to play with the medium. Plain and simple, even if the stories are not all perfect, this is comics done right. Pope is powerful on every page and takes chances few of his contemporaries will. There are an almost infinite number of detail and triumphs for fans and budding writers and artists to take note of throughout this collection. Both as entertainment and inspiration, One Trick Rip-off/Deep Cuts is wonderful. One Trick Rip-off/Deep Cuts is not a book to be read once forgotten on a shelf; it is a deep, palatable work meant to be chewed on and mulled over. Read it again, pour over it and search out the subtle flavors and richness it hides between its covers. Paul Pope is a treasure and One Trick Rip-off/Deep Cuts is a testament to his skill. In it, readers are privileged to witness an auteur craft and hone his vision for the comics medium. As a comic, it is thoroughly enjoyable. But as an experience, as an insight into an artist building and perfecting his skills, it is irreplaceable.